The KBS LTER attracts numerous scientists from around the world to explore questions related to the ecology of agricultural landscapes. These associated projects are externally funded by a variety of sources. If you are interested in using the KBS LTER site for a research project, please visit our CONDUCTING RESEARCH page. Anderson, C.W., D. Gallagher, S. Spiegel, T. Getty, and B. Covitt. 2014-2019. Sustaining reponsive and rigourous teaching based on carbon: Transformations in matter and energy. NSF DRL. Bahlai, C., D. Landis, and Z. Szendrei. 2015-2016. Exploiting the landscape of fear as an insect control tactic. Project GREEEN. Basso, B. (PI). 2015-2019. Developing and promoting water-, nutrient-, and climate-smart technologies to help agricultural systems adapt to climate and societal changes. USDA-NIFA. Bonan, G. (PI), et al. 2014-2017. Decadal prediction of sustainable agricultural and forest management- Earth system prediction differs from climate prediction. NSF-USDA (UNH). Chilvers, M. 2016. Improving management of wheat diseases, short and long term solutions. Michigan Wheat Program. Donohue, T., K. Keegstra, B. Dale, R. Amasino, R. Landick, J. Ohlrogge, and G.P. Robertson. 2013-2018. Great Lakes Bioenergy Research Center. DOE Office of Science (Biological and Environmental Sciences Division; KBS LTER hosts sustainability research, 1 of 4 science areas). Emery, S. and K.L. Gross. 2015-2017. Can soil biodiversity increase biofuel feedstock production and ecosystem services on marginal lands? USDA AFRI: Agroecosystem Priority Area (Univ. Louisville). Evans, S.E., L. Tiemann, M. Friesen, and J. Cole. 2015-2020. Connecting nitrogen transformations mediated by the rhizosphere microbiome to perennial cropping system productivity in marginal lands. DOE. Gelfand, I. and G.P. Robertson. 2014-2016. EAGER: Collaborative Research: Development of a new technique to measure ecosystem-level soil nitrous oxide fluxes using micrometeorological towers. NSF. Grandy A.S. and M. Daly. 2013-2016. NSF Graduate Research Fellowship: Linking microbial community structure with nitrogen cycling in response to priming. NSF (UNH). Grandy, A.S. and A. Jilling. 2014-2017. 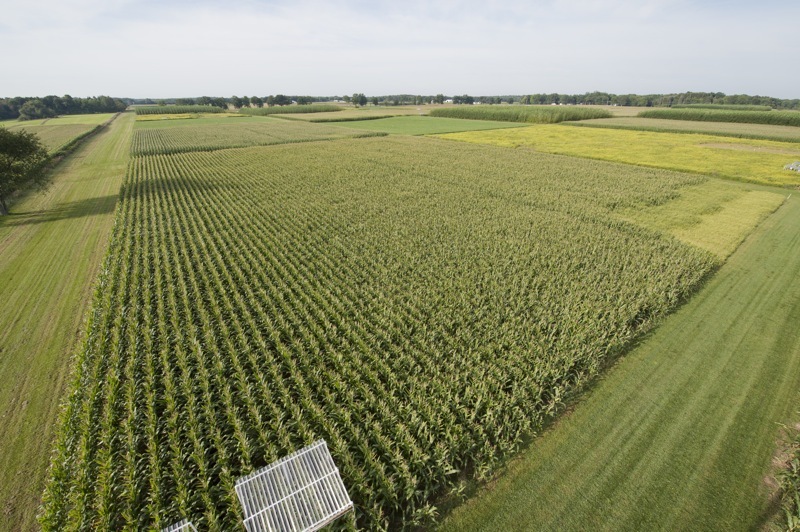 NSF Graduate Research Fellowship: Effects of nitrogen management on nitrogen availability to plants. NSF (UNH). Grandy, A.S., R. Smith, K. Broders, and E. Hobbie. 2013-2017. Nitrogen synchrony at the crop-soil interface: optimizing root-microbe interactions to minimize environmental nitrogen losses. USDA-NIFA (UNH). Gross, K.L. (PI). 2015. REU Site: Ecological and evolutionary dynamics in a changing world: A scaffolded undergraduate research experience. NSF. Hamilton, S.K., D. Hyndman, B. Basso, and G.P. Robertson. 2015-2017. FEW Supplement to KBS LTER: Implications of expanding irrigation and changing climate for terrestrial water balances in the agricultural Midwest. NSF. Hess, L. and P.A. Matson. 2015-2016. The effects of changing rainfall patterns on agroecosystem nitrogen cycling and losses. Stanford University (Stanford). Hestrin, R. 2015-2016. Microbial contributions to plant nitrogen uptake: Arbuscular mycorrhizal fungi and soil bacterial communities. NSF IGERT and Cornell ACSF (Cornell). Hestrin, R. 2016-2017. Rethinking soil nitrogen cycling: Can the movement of nitrogen from ammonia point sources through soil contribute to plant and fungal nitrogen nutrition? NSF IGERT and Cornell ACSF (Cornell). Hockaday, W. and Z. Valdez. 2013-2018. NSF Graduate Research Fellowship: Effects of management practices on soil carbon storage in switchgrass bioenergy agrisystems. NSF DGE (Baylor). Honroth, S. and A. McCall. 2016. Disruption of the legume-rhizobia relationship by N-addition and its effect on pollinator behavior and herbivory. Denison University Batelle Fund (Denison). Kravchenko , A. N. and T. Marsh. 2014-2016. N2O production at micro-scale: understanding microbiological mechanisms. Discretionary Funding Initiative, MSU. Kravchenko, A. N., A. K. Guber, T. Marsh, and N. Ostrom. 2016-2019. Micro-scale mechanisms of N2O production in soil. NSF Geobiology Program. Kravchenko, A. N., K. Renner, and A. K. Guber. 2016-2017. Topographically diverse landscape influences on cover crop establishment. Project GREEEN. Landis, D. A., B. Wills and A. Myers. 2016-2017. Developing highly productive monarch butterfly habitats for Michigan’s agricultural landscapes. Project GREEEN and MSU Entomology Discretionary. Lau, J.A. and K.T. Heath. 2013-2016. Evolution in LTER experiments: Ecological and evolutionary consequences of long-term nitrogen addition for the legume-rhizobium mutualism. NSF-DEB. Malmstrom, C.M., D.A. Landis, and R. Isaacs. 2011-2016. Control and mitigation of generalist pests in perennial grass-dominated bioenergy landscapes. USDA-NIFA. Millar, N. and G.P. Robertson. 2016. Nitrous oxide quantification and mitigation in Mexican grain crops under different nitrogen management practices. USDA-FAS. Ostrom, N. 2014-2016. Collaborative Research: High-precision triple-isotopologue analysis of N2. NSF Geobiology and Low Temperature Geochemistry. Peralta, A.L., J.T. Lennon, and L.A. Hoagland. 2012-2016. Land use legacies in soils: Effects of crop diversity on plant-soil-microbial interactions. USDA-NIFA. Quigley, M.Y. 2015-2017. Using stable isotopes and computed tomography to determine mechanisms of soil carbon protection in cover crop based agricultural systems. USDA-NIFA AFRI ELI Predoctoral Fellowship. Robertson, G.P. and S.K. Hamilton. 2015-2020. Collaborative Long-term Agricultural Research (LTAR): Ecosystem services from row-crop agriculture. USDA. Snapp, S. 2013-2016. Fostering complex soil food webs and building soil fertility with organic production of perennial wheat: Phase II. The Ceres Trust. Stuart, D., B. Basso, S. T. Marquart-Pyatt, G.P. Robertson, and J. Zhao. 2013-2017. CNH: A social-ecological analysis of nitrogen in agricultural systems of the upper Midwest. NSF-DEB. Tiemann, L. 2015-2016. How does cover crop chemistry regulate the soil microbes, SOM dynamics and plant available N? MSU AgBioResearch Project GREEEN. Weigel, D. 2014-2016. Evolution in action: a 200-year experiment of adaptation in a clonal lineage of Arabidopsis thaliana. Max Planck Institute for Developmental Biology. Zarnetske, P. and K. (Browning) Welshofer. 2015-2018. NSF Graduate Research Fellowship: Uncovering the direct and indirect effects of climate change on plant communities. NSF.